I like to combine healthy proteins like fish with lots of great veggies and create awesome flavors to make quick meals yet, food with complex flavor combinations and naturally gluten free. 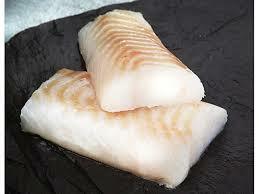 Case in point; a frozen fillet of mahi mahi. I keep a couple individually wrapped fillets in my freezer to form the basis of a quick meal; it has a firm meaty texture and will work well with a number of ingredients. Finding it somewhat bland I like to spark the flavor with a couple great additions to create a delicious meal, olives and capers to name those chosen today. This is somewhat of a vague recipe, you can use more or less of the ingredients depending on your pantry and your palate. I used salad olives that have pimento in them, even more flavor! Heat a tbsp. of the olive oil in a medium sauté pan. Add the fish and cook 3 minutes lip it and cook 3-4 more minutes. You want a nice lightly browned fillet but not overcooked. Remove from the pan and set aside, covered so it doesn’t get cold. Add the rest of the oil, heat, add the onions, stir, add the celery and cook, stirring frequently until they begin to soften, 3-4 minutes. Add the zucchini and the swiss chard. Stir and cook 5-6 more minutes. Add up to 2 tbsp. water if the pan seems dry. The water creates steam and helps to cook the veggies. Don’t over do it or you will have a soggy mess. After 4 of the 5-6 minutes add the chopped olives and the capers. When the veggies looks about done, return the fish to the pan and pour the fresh lemon juice and Vermouth over the fish and the veggies. Stir another few seconds. Add a tbsp. of butter and, while it melts, season with a few grinds of fresh pepper. The butter, lemon juice and wine form a delicate sauce that clings to all the veggies. 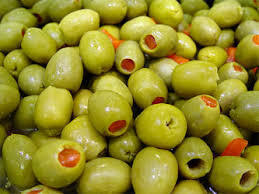 Taste before adding any salt as the capers and olives provide a fair amount of salinity and it is impossible to remove salt once you sprinkle it on. Serve over hot steamed rice. I love it over long grain brown rice or long grain white rice. It is a complete meal without any additions. Creating it should only take 15 minutes if you already have some cooked rice available. White rice can be made in less than 20 minutes. 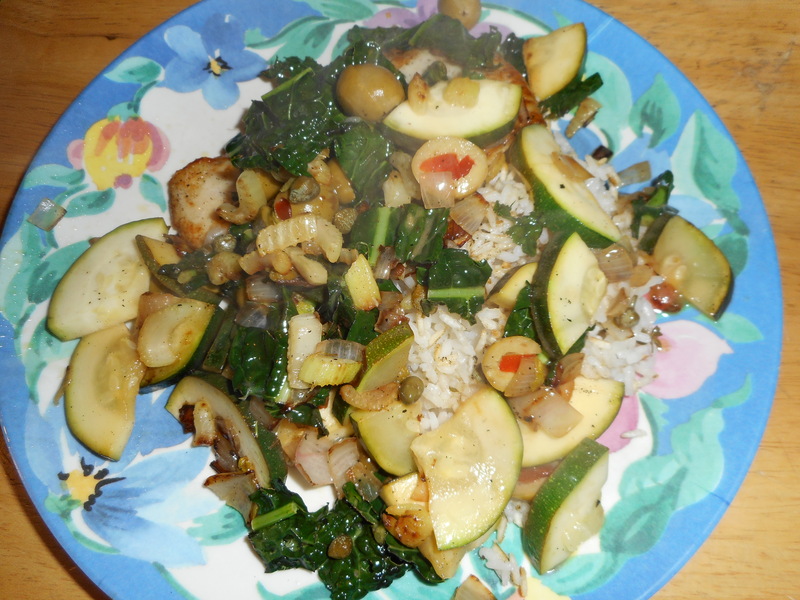 Enjoy this healthy yet very flavorful meal some evening soon! Chilly days and long dark nights demand warm, hearty suppers. But your main dish does not have to be expensive or fattening, it can be gluten free and still tasty. This recipe is naturally gluten free. No flour in it or bread products needed. I had some hot Italian sausage left over from the package I bought to make my turkey stuffing. I had a sweet dumpling winter squash and a big red bell pepper. Some quinoa grain and an onion and I was in business to throw together a homey flavorful main dish. Add a salad on the side and it is a well balanced supper that can be baked and then seconds enjoyed for lunch. This makes 3 servings, can double the recipe easily, just bake it in a bigger pan. 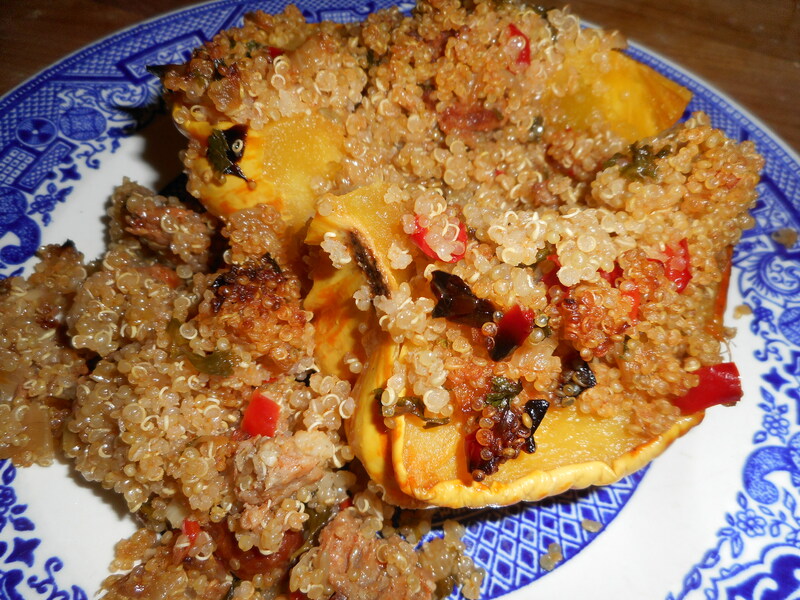 a plate of stuffed dumpling squash. Not that pretty to look at but the sausage makes it very flavorful. I had the sweet dumpling on hand but I have made this same recipe with an acorn squash and with a delicata squash. A delicate is a small oblong squash with orange and green stripes on yellow skin. All three are great vessels for this riff on stuffed peppers. I happened to have a big red pepper and stuffed it as well. delicata squash; can be pale cream with green stripes too. Heat oven to 400 degrees. Cut the squash from the tip to the blossom end. You probably should cut off that stem bit first; makes the cut easier. Scoop out the seeds and stringy stuff. Spray a small rimmed baking sheet with cooking spray and place the cut squash halves cut side down. Roast 30-45 minutes; check by piercing with a fork; remove when tender enough to stick the fork in but don’t cook it so far that it collapses. After the squash has been in 15 minutes add the red pepper squash which you have cut the lid off, emptied the seeds out and cut up the top third into small dice. Reserve the dice for later. The lower two thirds is a tasty vessel to hold more quinoa sausage filling. Meanwhile, as the squash and pepper bake…. Heat 1 and a 1/3 cup of water, ½ tsp. salt and then add the quinoa, cover and cook 14-15 minutes. 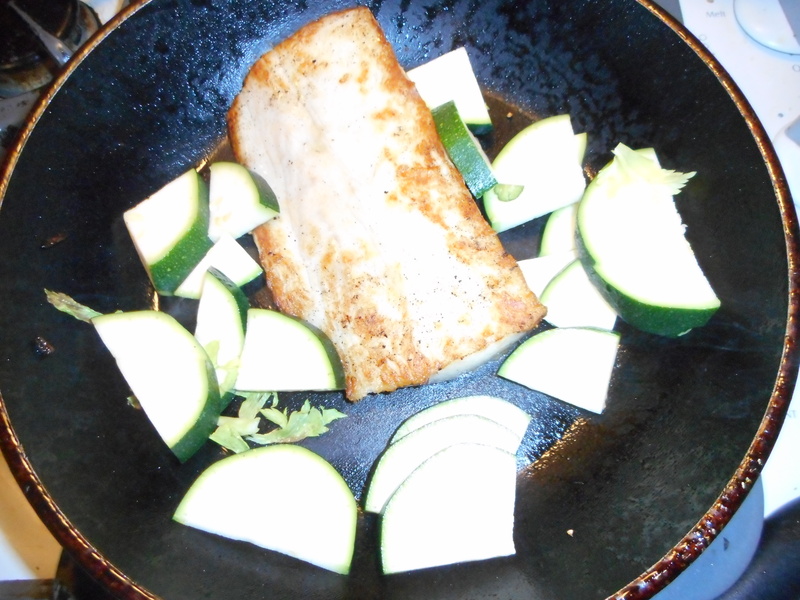 While that cooks….put the EVOL in a frying pan, add the links which you have liberated from their skins. Cook 4-5 minutes, chopping them up as they cook. An alternative is loose sausage meat; 1/3 to a half pound should do it. Stir them up, flip to cook all sides. Should be browned but not burnt. After you flip them over add the chopped onion, cook about 3-5 minutes stirring often. Add the minced garlic and the top 1/3 of that red pepper cut into small cubes. Keep stirring and when the onions and red pepper bits are softening add the quinoa. Leave any liquid in the pan. Stir the quinoa/sausage/veggie mixture. Heap it into the squash halves and the pepper half. Mound half the extra filling into a small 1.5 quart round baking dish. 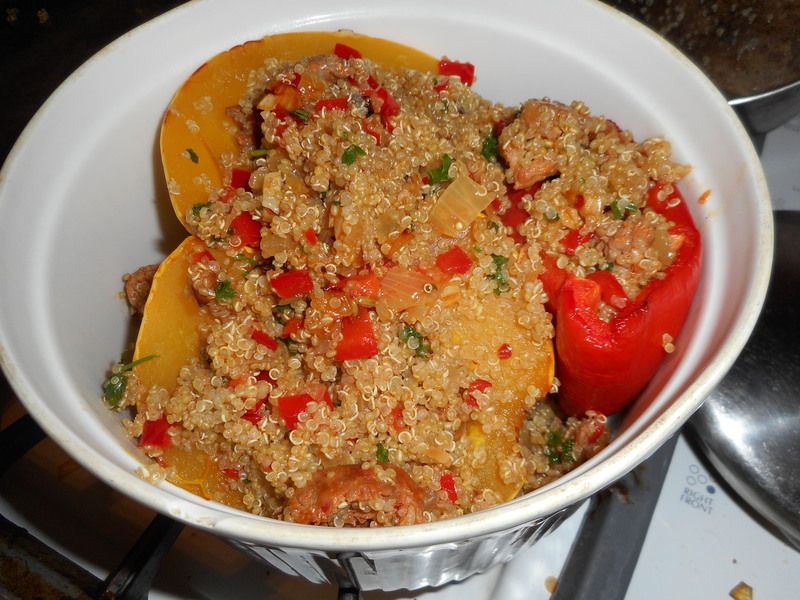 Place the three stuffed veggies on top and pour over the rest of the filling as well as any quinoa liquid in the pot. Cover with foil and bake at 400 degrees for 35-40 minutes. The veggie filling should be bubbling when it is done and the squash is tender to a fork. Enjoy with a side salad. I reheated some of the leftovers for lunch the next day. It gives you something much better than something cold for your mid day meal. If you don’t like red pepper; make it with 2 small winter squash and just leave the chopped pepper totally out. You could sub in half a chipped carrot for the red pepper bits. Use a mild Italian sausage if you prefer it less spicy or leave the sausage out to make the dish vegetarian. I am guessing you could try to bake it in your crock pot; maybe like 2 hours on high. If you try that let me know how it turns out. It is a versatile recipe for sure! I saved my seeds, rinsed and dried them to toast for snacking: waste not want not!